The Brigand of Kandahar is a novelty where Hammer films are concerned – namely that it has seldom been seen. After viewing it you will understand why, as it must rank as one of the studio’s slowest and least imaginative offerings. Written and directed by Hammer stalwart John Gilling, this ‘boys own’ adventure set during the British rule of India in the 1850’s and starring Oliver Reed (The Curse of the Werewolf (1961)) and Ronald Lewis (Taste of Fear (1961)) has very little to recommend it either in acting or production values. After being branded a coward in action, mixed-race British army officer Lieutenant Case (Lewis) escapes imprisonment and joins a local group of Indian rebels led by the charismatic Ali Khan (Reed) in their fight against the British occupation. Many Hammer films (particularly their non horror titles) were ‘B’ pictures often shown as double bills or supporting titles to bigger releases. The Brigand of Kandahar clearly fits this bracket, with an air of being made simply to fill contractual obligations (it was the last film Reed, Lewis and British ‘Scream Queen’ Yvonne Romain were to make for Hammer, as well as marking the end of the studios long association with Columbia Pictures). With the appearance of those Saturday morning western serials popular with young boys during the 1950’s, the acting appears almost as cardboard as the scenery. The Brigand of Kandahar would never get past the idea’s stage today. Though authentic in it’s representation of the Victorian British ruling classes, their treatment of foreign nations as depicted in this and similar films (such as Carry On Up The Khyber (1968)) will likely appear offensive to many of today’s politically correct audiences. This attitude is highlighted by the studio’s habit of using white British actors to play ethnic races (a widely prevalent practice in film making at the time) as seen here with a heavily made-up Oliver Reed in the role of Indian tribal leader Ali Khan. 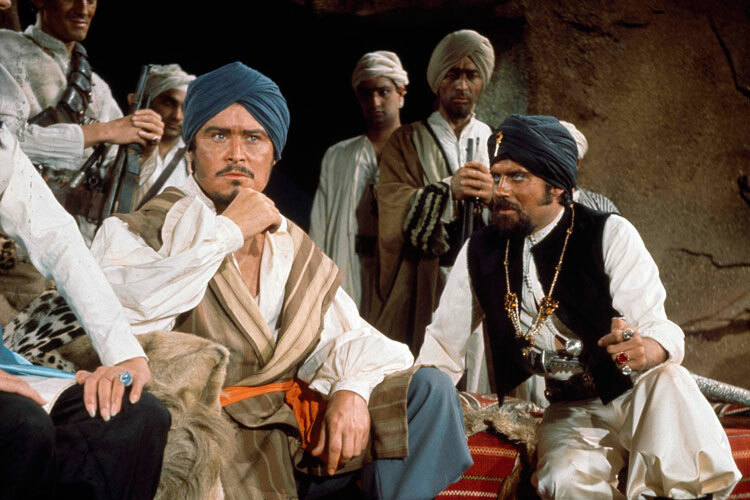 The Brigand of Kandahar could be viewed as a testament to two lost worlds, namely those of the once mighty British Empire and the equally powerful Hammer Studios. In the light of the film, the eventual demise of both may be seen as an inevitability.